New York has put down 350 kilometers of new bike lanes since 2007, bringing the total to 683 miles (1,100 kilometers) and a target of 1,800 miles (2,900 kilometers) by 2030, according to the mayor's office. Bicycle lanes, cycling lessons for adults, and soon 10,000 bikes in a sharing program: New York is pedaling hard to join the world's growing love affair with the bicycle. But if this can still be a perilous activity, that's starting to change, with 350 kilometers of new bike lanes put down since 2007, bringing the total to 683 miles (1,100 kilometers) and a target of 1,800 miles (2,900 kilometers) by 2030, according to the mayor's office. 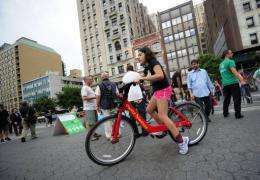 The city has rolled out demonstrations and a large crowd came in the rain at Union Square on Thursday to get their first glimpse of the colorful bicycles. "I've been waiting for that for ages," said Qinn, a 17-year-old student from the borough of Queens. "The subway is expensive. I can't pay a monthly ticket, while using the bikes will cost 104 dollars a year -- less than the monthly fare for the subway." 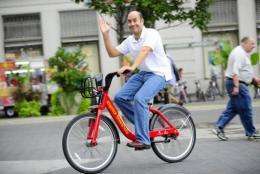 Victor Matos, a photographer who has biked in the city since the '70s, said he was worried about the shared bicycles being vandalized, but he said the initiative would be popular, not least for tourists. The city says that while bike use is up, the total number of accidents is stable. According to a Hunter College study, some 500 pedestrians are hurt each year by cyclists. At Bike New York, there is nothing but optimism. The organization is seeing "very high demand from a wide array of people" for its cycling lessons, Tongco said. This year, 3,650 adults and children took courses. Others come to learn how to repair their machines. 104 dollars is _exactly_ the cost of the monthly fare on the subway. I pay that every month! Good luck riding bike in snow or rain. Will be nice in a summer though!